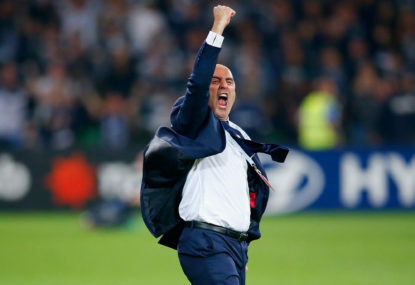 Keisuke Honda and Raul Baena were both late scratches from this game, so Kevin Muscat fielded the same team he did last round in the derby. Georg Niedermeier was also out, but we were forewarned of his absence and so were not waiting on news regarding him. Wellington, with David Williams in the starting XI for the first time in a while, arrived intent on extending their fine run. Roy Krishna had an early chance, rounding Lawrence Thomas before screwing his shot high. These Kiwi upstarts certainly are playing free from the shackles of self-doubt and fretting inferiority. As he said he would before the season, Mark Rudan has enacted as much a transformation of confidence as he has one of Xs and Os. The Victory confidence was given a winding blow after ten minutes when Nick Ansell stretched for a block and then hunched over, clutching the back of his thigh. A pained expression, mouthing “it’s my hammy,” was a sorry sight for Muscat to witness, worsened all the more by Niedermeier’s aforementioned absence. 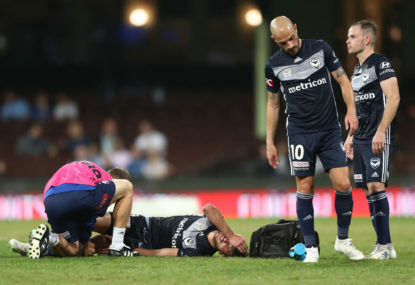 Josh Hope was brought on, utility maestro Leigh Broxham was moved from left midfield to the centre back spot and the Victory took on a rather makeshift look. It didn’t take long for Sarpreet Singh to sparkle, the 19-year-old anointed recently by Mark Bosnich as the league’s most in-form player. A wondrous dribble, weaving through multiple Victory defenders, saw Singh flirt with the idea of a shot – a fearsome prospect – before sliding in Krishna. His cross flashed across the face, yearning for a spare foot to meet but not finding one. 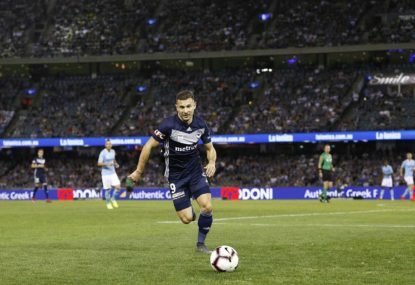 Terry Antonis, out on the right of the diamond, quickly began building a case against his Asian Cup exclusion – James Troisi, although by far the more vocal proponent of said case, was something of a paralegal here, making a contribution, sure, but not quite the source of the main compelling thrust. Antonis’s fine ability to move subtly into small spatial pockets is matched only by his willingness to quickly act with forward-thinking intent once he receives the ball in those pockets. A raking diagonal ball, a shot powered off the laces, a neat instepped pass ahead to a teammate – all these actions are performed with technical distinction and, crucially, with speed. This is a rare combination of qualities for an Australian midfielder. 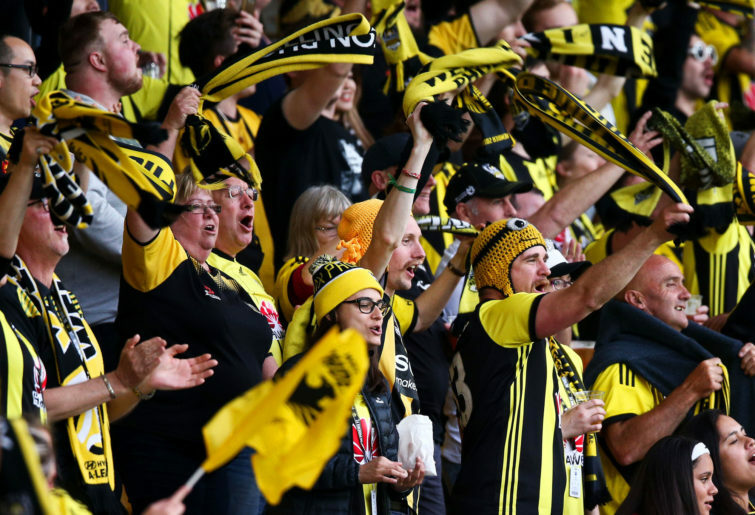 The game was rather open, a fairly normal state of affairs for Wellington, who have conceded almost as many as they’ve scored, but not so for the Victory, who have scored more than twice as many as they’ve seen fly past Thomas. Wellington would wash forward, Singh, Krishna, Louis Fenton and Mandi combining fluidly, before a Victory defender would break up the play and initiate a counter-attack Wellington often found hard to deal with. Outside of transition opportunities, the Wellington defence was coping only a little better, trying to press the Victory into bad lofted passes in early phases of their possession. But when the first line of pressing was survived, the defensive structure Wellington erected behind it was rather limp. Additionally, the touch of Ola Toivonen meant that a number of those bad lofted passes were converted into good ones, such was the softness with which Toivonen accepted the ball, often relaying it first time to a teammate. Steven Taylor, a player who seems to relish the visceral, concussive aspects of his role like a caveman would relish clubbing a sabre-tooth tiger to death, threw himself into an astonishing headed clearance, meeting a powerful shot squarely and willingly with his bonce in mid-air, having contorted his body into near-horizontality to allow for the act. It was wholly emblematic of the sense of desperation that seemed to fuel the defences of both teams. The match was bristling with the intent to score but went into the break 0-0. Melbourne emerged with energy, with Hope a little keener to surge forward and join the attack than he had been to end the first half. Both teams were taking turns applying five-minute periods of attacking pressure. Troisi struck a swerving right-footed shot that Nix keeper Filip Kurto could only bat away with a forearm. Krishna curled a shot inches wide, a chance capping a straight-line counter-attacking run. Then David Williams, who had been a little muted, sprung into the forefront of the match with a pearl of a goal. Dallying down the left of the field, he cut sharply inside, with Storm Roux lurching, wrong-footed. Williams struck the ball with his right foot, and it was the kind of shot that was a goal the instant it left his foot, curling into the far top corner. Thomas dived in vain. A wonderful opener, and Wellington led 1-0. Kenny Athiu was brought on. Two towers up front, then, for Muscat, with Toivonen and Athiu cutting equally imposing silhouettes. 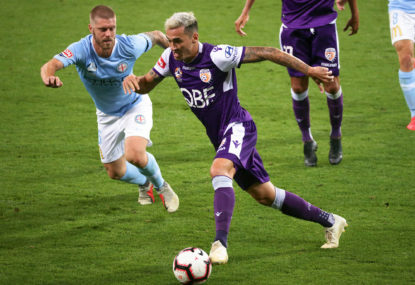 Melbourne tried to up their ante and fight for an equaliser. Wellington, rightly, were not easing back into purely defending their lead; they are not good enough defenders to do that with 20 minutes left in the match. Melbourne are too skilled an attacking team as well. And the Victory would indeed equalise in the 76th minute. A Barbarouses cross was weakly cleared by Andrew Durante, and Antonis chested the ball down and shot. His attempt was skidding well wide, so much so that it turned into a cross-goal pass, one that Toivonen simply had to toe over the line. It was 1-1, and the goal-scoring promise this match had from the start was being realised. Melbourne had all the momentum and were careering forward as a team, hunting for the winner. Wellington were a little rattled now, working on the break. Nathan Burns came on for Williams, fresh legs to improve the viability of those counter opportunities. Barbarouses smashed a whizzer of a volley just over the bar after he was set up by an excellent Athiu header. 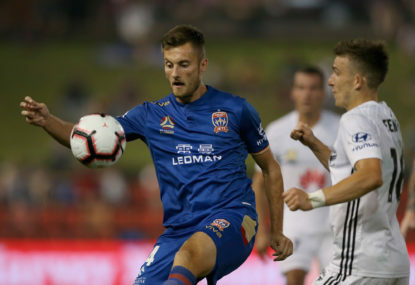 Antonis had what looked like a sure goal, running clear onto a rebound after Kurot palmed away a Barbarouses shot, but Michal Kopczynski threw himself across to block it, an astounding bit of last-ditch defending. Like a dying fire, there were some snaps and pops, half-chances as the embers smouldered away, but that would be it. It finished 1-1. Wellington’s improvement is no mirage, as much as the last few years of terrible underachievement have felt like a desert. Their quality going forward is such that they can threaten even the best defences; the 3-4-3 promotes Singh and Krishna’s assets, even though it gives a lot up in defensive stolidity. Melbourne, had they had their best XI on the pitch, would probably have won this game considering the chances they managed to forge without Honda et al. Antonis remains a wonderful, thoughtful attacker. Toivonen remains probably the smartest striker in the league.